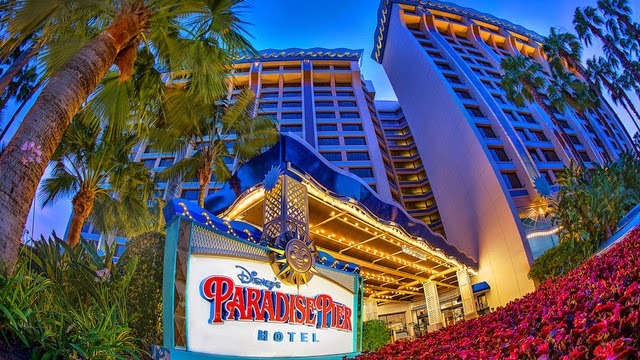 As I mentioned yesterday, this weekend Mason and I were given the opportunity to have a mini overnight staycation at Disney's Paradise Pier Hotel with my sister-in-law and nieces. They were already staying at the hotel all weekend and had invited us to come hang out at the pool with them. We were going to go on Saturday but then errands and a forgotten haircut came up. 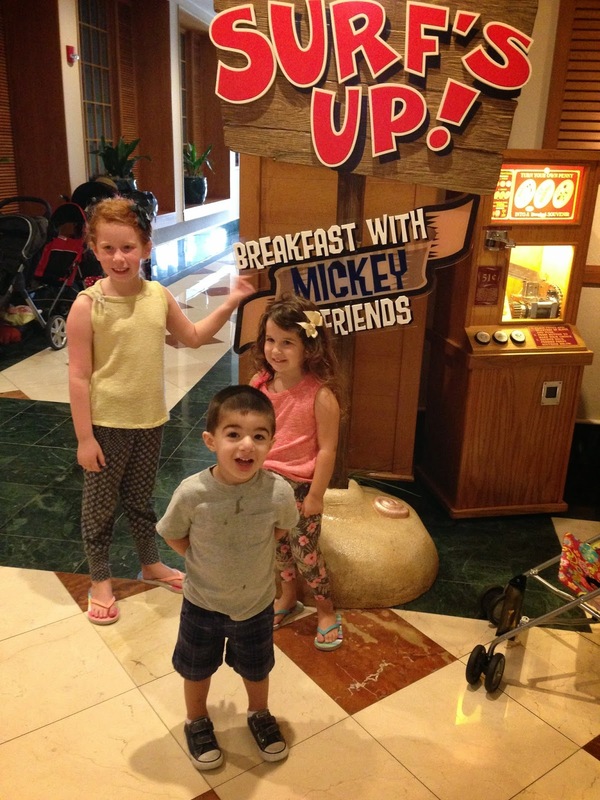 I suggested Sunday morning and asked if they had a fancy character breakfast at their hotel that we could go to and our mini staycation was born! Mason and I arrived at the hotel on Saturday night around 7:30pm so excited to be so close to Mickey's house for the evening! We met them in the lobby where Emma and Addison were watching a movie in a little room off the lobby. (Top right above). The little room had mini aderondeck chairs and they were playing one of the old school Mickey movies. Mason's interest in the movie lasted about 0.2 seconds and then he just wanted to stand in front of the screen and block everyone else's view. It was close to his bed time and he was getting kinda cranky so I suggested that we head upstairs. As we were heading to our room, I noticed (aka Emma pointed out to me) that the carpet had Mickey's on it. Gotta love Disney. They never leave a detail out. We got up to the room, unpacked a little, and Emma insisted that we go down to the gift shop and also to see Goofy in the lobby. So we did. We start to head down and notice that they are playing a movie on a big screen outside so we go check that out instead. The sweet workers get us all chairs and Erin gets some towels as blankets since it's a little windy and chilly. Again, Mason won't sit still and is more interested in getting up in everyone else's business. I try to have a serious talk with him but clearly that doesn't go well since he's two. I give it a few minutes and then suggest we check out the gift shop instead. We head down and check out the over priced candy bars for $2 and all the Mickey stuff and then venture to see Goofy. 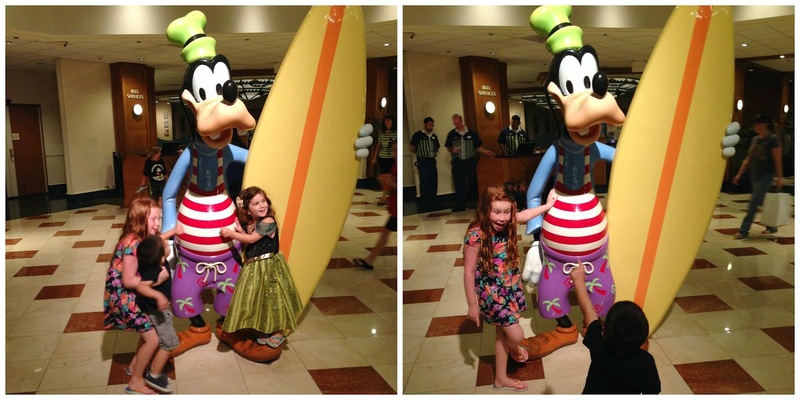 I tried so hard to get Mason to take a picture with Goofy (and the girls) and this is the best that I got. Toddlers. Always on their own agenda. We head back upstairs and decide that it's probably time to head to bed...which means bed for all of us since we're all in the same room. I'm excited because I think I might actually get a full nights sleep but Mason has other plans. Right when I put him in the pack n play, he cries his little eyes out. BAWLS his eyes out. Even though it's pitch black, I can see him sticking his arms out for me. Break. My. Heart. I almost started crying myself. I tried to comfort him as best as I could without picking him up because I knew that would just make it ten times harder to put him back. I lay on the floor and try to get him to lay down too and eventually (after what seems like a heartbreaking forever) he does. I think I'm in the clear and try to get up and he starts crying again. I lay back down. I contemplate sleeping on the floor but am slightly grossed out by it, so I just wait a few more minutes. I get up and get in bed. No idea how much later, but Mason starts crying again. I feel horrible since he probably just woke everyone up. I console him again. He's ok. Then crying. Then ok. Then crying. Then ok. I have no idea what's going on because this is so not like him. I get back in bed. He cries out again a little later but I am able to "shush" from the bed and he's ok.
We wake up in the morning around 7:30am and quickly all get ready for our 8:20am breakfast reservation. We arrive and they want to take a picture with us and Mickey. I think this should be pretty easy but Mason sees Mickey and starts crying and grabbing me. They take a picture of the girls and Mickey and then all of us because there is no way Mason is letting go of my arm. 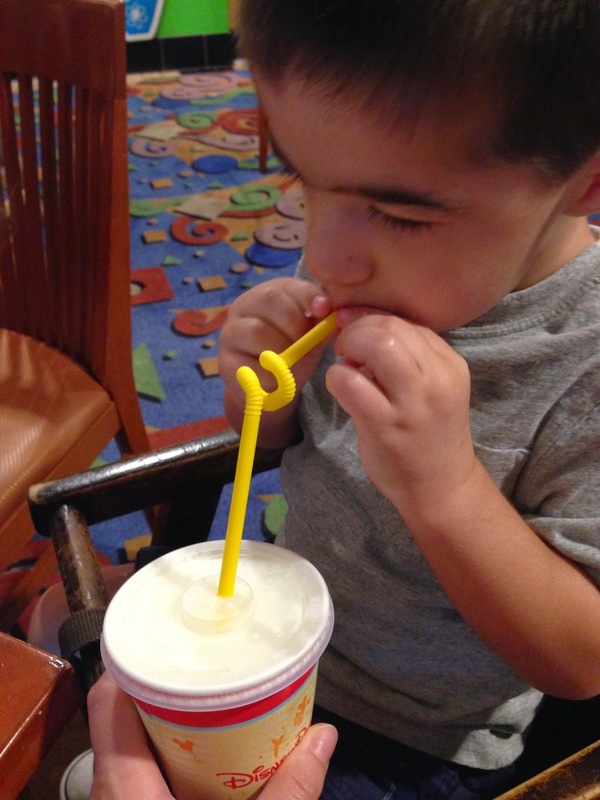 We sit down, I grab some food for Mason, and the waiter brings us a kids milk with a really cool straw. 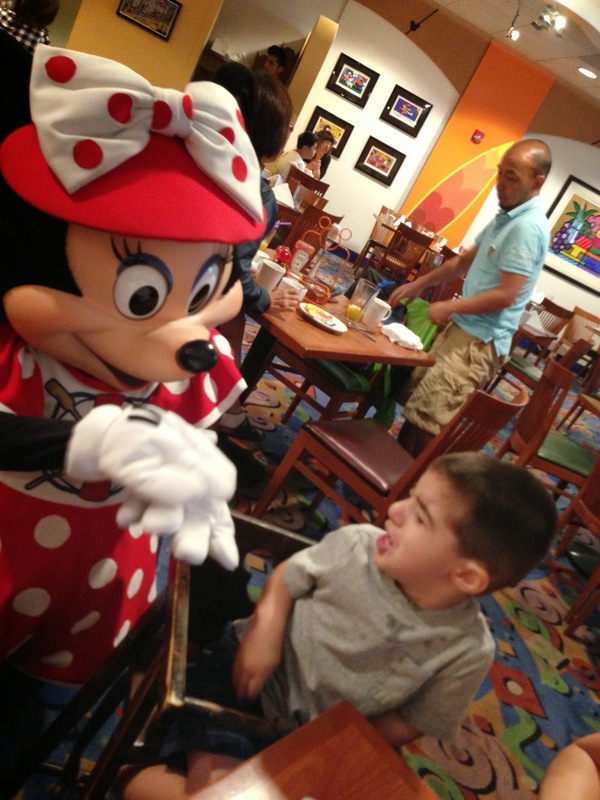 ...and Mason was less than thrilled with seeing Minnie. He HATED the characters getting so close and trying to talk to him. But LOVED (and waved at them!) when they were across the table. Toddlers. Crazy I tell ya. 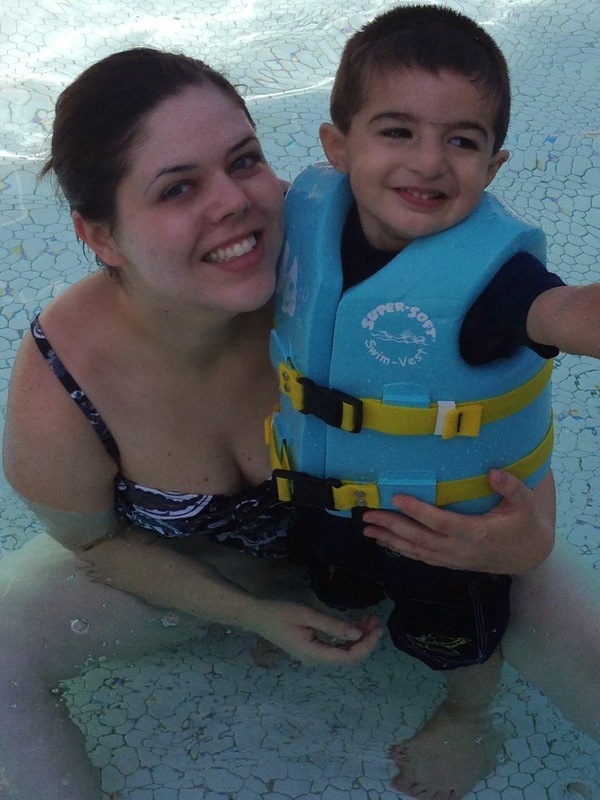 We finished breakfast, went up to the room, and changed and headed out to the pool. I was surprised by how nice the pool was and how awesome their water slide was! I only went on once since I had Mason (Auntie Erin watched Mason) and it was so much fun and a lot faster than I expected. 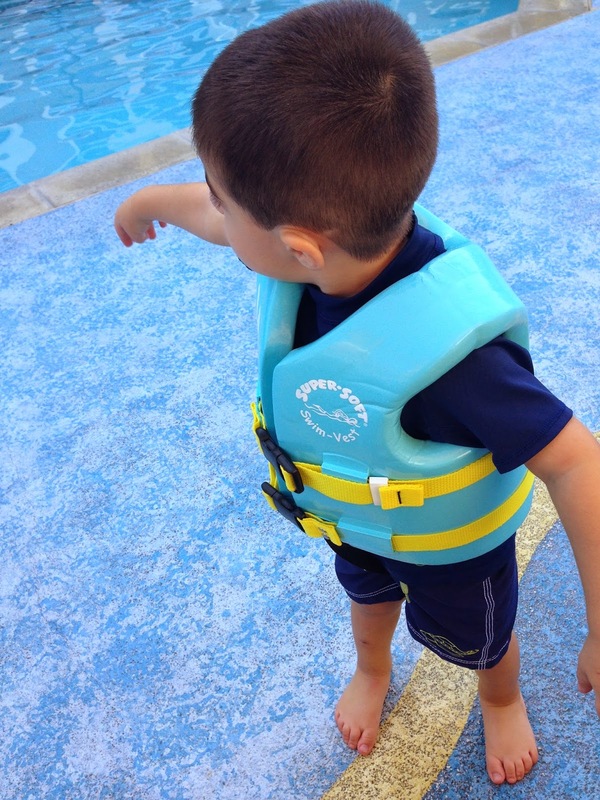 He looked so cute in his little life vest and had a BLAST swimming in the big pool as well as the baby pool. We swam for about an hour and then had to go back to the room to pack and check out. Overall we had an incredible time on our mini vacation. ugh, Aria did the same thing one of the nights at Disney. The one where our babysitters were also sleeping, so I just felt so inconvenient and annoying. Just sleep! It is fun to sleep at a hotel! Promise! I was laughing at the pics of Mason and the characters. I was so sure that would happen with Aria and was totally surprised when she was like hey let me touch you, want some bacon? You just never know! 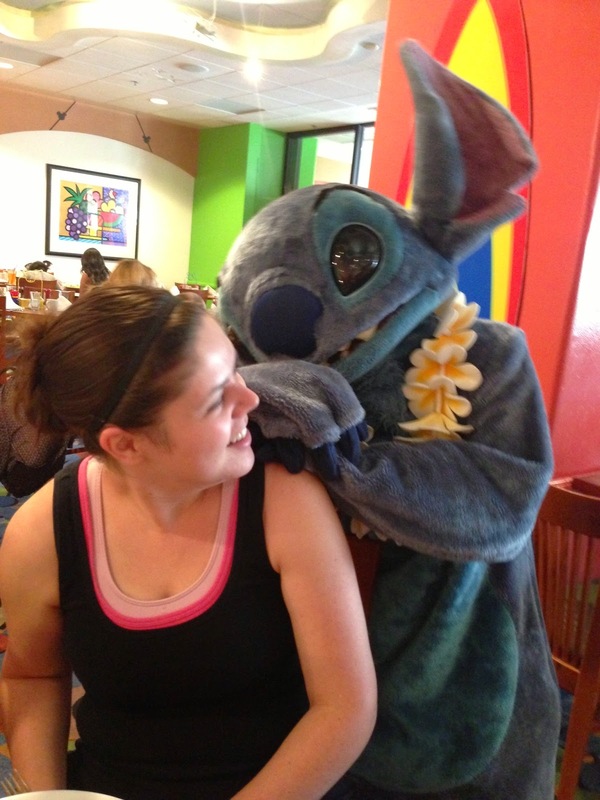 Gosh I love Disney character breakfast buffets. Those are delicious. At least the pool time seemed to go flawlessly! Super nice to join in on the fun. An old friend from college is on her honeymoon at Universal, think they'd mind if the fam crashed it? Yes? shoot. I think everybody headed to Harry Potter-ville this weekend and this week, I keep getting all the jealous pictures pop up on my fb feed. Just rub it in guys. Lol seriously toddlers are ao unpredictable! We try to so something amazing for them...ha! I get it though. Must have all been so overwhelming. As far as the sleeping, does he sleep in a pack-n-play any other time or was it brand new? Did he sleep through once he finally fell asleep? 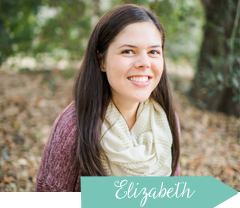 I ask bc we are traveling at the end of the month and am totally clenching my teeth even thinking about the sleeping sitch! Glad y'all had some much needed fun girl! What fun!! Sorry about the tough night's rest! It must have been the change in scenery and people in the room- sometimes Parker is the same way when we travel! Yay Disney! :) Sounds like a fun time, minus the sleeping/crying :( Poor guy. It stinks when they can't tell you what's wrong. Oh the characters- you never know if kids will love them or hate them! I remember when I was younger, I hid under the table from Chuck E Cheese at a friend's birthday party, haha :) Hopefully he'll like them as he gets a bit older. Kids can be so unpredictable! Looks like a fun place! We had similar experiences with Marcus and the Disney characters. I thought surely he would LOVE Mickey, but not so much. I don't get it, he's obsessed with Mickey any other time. Your hotel looked awesome. 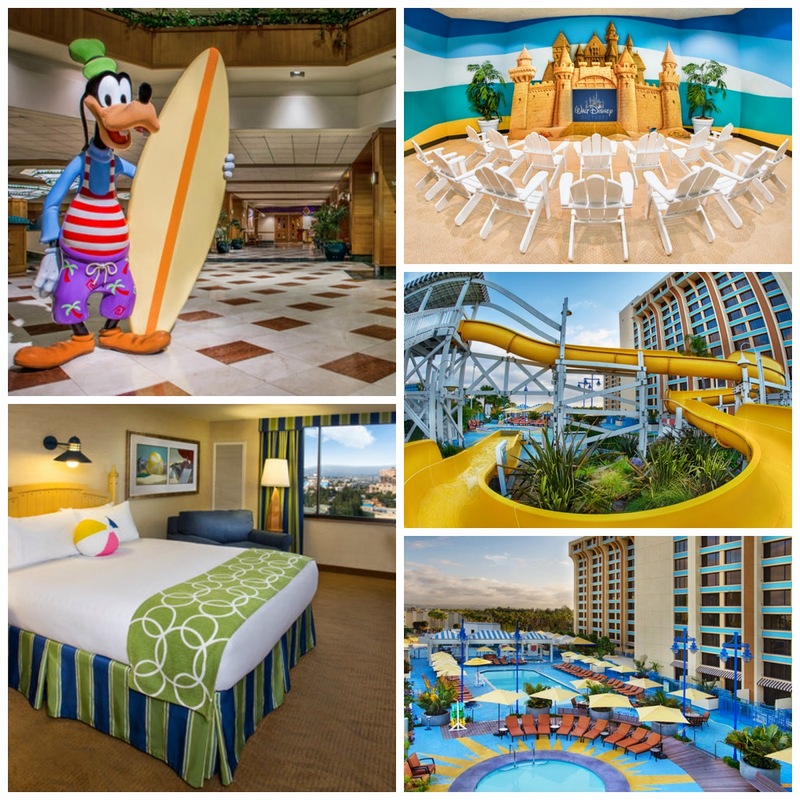 We've never stayed at the resort, but I think that's something we need to remedy! How fun! This place looks awesome. My Mason is totally opposite right now...he loves characters and you have to drag him away from them!